FuzzyWasabi: Unknown Afrofunk LP – Manu Dibango possibly? I might be stretching your patience with this one… very tribal feel. I think I found it on a russian blog and even then it was labeled as "Unknown Artist - Unknown Album". At first it sounded so modern that I thought it was out of the 90's England. After a bit of research, the sound is analogic for sure, so all the breaks you hear were performed live… The chanted intros are possibly from the Eastern Coast (Kenya? South Africa?). The sax parts make think of Manu Dibango, somebody who is always stretching the genres, so that's how I tagged it. Would love to know more about it – there's a 1-month Rapidshare subscription for anybody who can shed some light on this album. Meanwhile: Whey! Here it is. Definitely, this is a contemporary "Soul Fire" or "Desco" release. 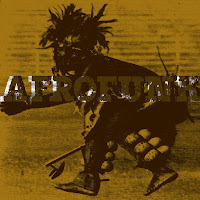 Maybe a promo press to the last announced - April 2004, but never released - "African Music Today Vol.1" - compilation. It was even given a release number: SFCD/LP006. Only track I could comfirm is #06: The Whitefield Brothers - In the raw (from the album of the same name).